Today’s installment is also cross-posted over at Deep Sea News today. Studies of sediment transfer within this context has been coined “source-to-sink” and involve the integration of several Earth science disciplines including sedimentology, geomorphology, hydrology, mineralogy/petrology, geochemistry, marine geophysics, and others. A big chunk of my current research is a collaborative source-to-sink project between Stanford University and the U.S. Geological Survey. 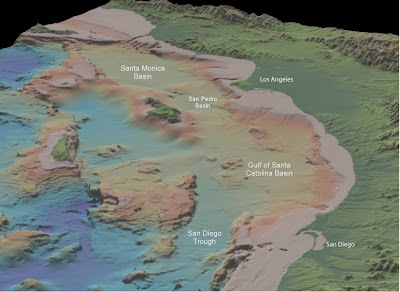 We are focused on the sediment records housed in the deep marine basins of the California Continental Borderland region offshore southern California (image at top of post ). The wrenching effects of the San Andreas transform fault system have created a highly segmented seascape with valleys, ridges, mountains (some of which stick out as islands), and deep basins. Using multibeam bathymetry, seismic-reflection profiles, and core samples, we can map the distribution and flux of continentally-derived sediment in these basins. The image above is a seismic-reflection profile from the Santa Monica Basin showing the nature of the basin fill . High-resolution mapping of the sea floor reveals a complex geomorphology complete with canyons, leveed channels, and fans. The image below is a perspective image  of Hueneme submarine canyon, the main sediment feeder to this basin. So, what are we finding out in these studies? A radiocarbon-dated Ocean Drilling Project core in Santa Monica Basin is tied to the seismic-reflection survey providing time constraints to the maps of sediment distribution. We then calculated the volumes of sediment that had accumulated over the last 7,000 years. The average flux over this time is approximately 3 million tons of sediment per year, which is a lot. But more interesting than the absolute numbers, is the variability of this rate at shorter time scales (hundreds of years). A couple thousand years ago, the sediment flux rate increases by a factor of five and is then much more variable from then on. What is causing this variability in flux? This is the primary question we are working on now. Some paleoclimate records for the California coast  indicate a shift from weaker and fewer El Niño’s to stronger and more frequent El Niño’s around this same time. Since the main source of sediment to this basin is a river we can begin to connect these climatic fluctuations directly to the record of sediment flux. These preliminary results are from a recent presentation at the AGU conference  in December 2006. This study will be submitted for publication soon. I should’ve quantified the time frames I’m talking about with this kind of research. It’s all relative. “ancient oceans” I should’ve said “past oceans” or something else. A lot of source-to-sink studies are quantifying physical/chemical transfer of material over the last century. Some are going into glacial-interglacial time frames and some into the millions of years time frame. So when I said ‘ancient oceans’ I didn’t mean Archean or anything. So I guess same goes with the ‘ultimate resting place’ comment. Of course it doesn’t stay there forever…this is all within the context of investigating sediment transfer and how it relates to other Earth surface processes. So in the last paragraph of the post, I mention studying these patterns back to 7,000 years ago. If you study the modern ocean and/or modern Earth surface processes, say the last century at most, then that time frame is only ~1.5% of the last 7,000 years. So, the lesson is we all oughtta put a ballpark number with anything we are talking about…at least within an order of magnitude. The Earth is so dynamic across such a broad temporal scale that nearly everything can be described as a transient feature and we won’t be able to communicate with each other with the terms ‘ancient’ and ‘recent’. Deep sea sediment records provide you with continuous and (relatively) unaltered records going back into the Cenozoic, preserving the changes accompanying the transition from a much warmer world to our current one with permanent polar ice caps – that’s a pretty useful thing to have. You get much older rocks on the continents, of course, but the sequences are cut up by faulting and are often more altered, so our knowledge of those older times is a lot less detailed and harder to interpret. Some of us like the challenge though!